Executive Education Certificate in Applying Behavioral Insights to the Design of Public Policy, Harvard Kennedy School of Government 2016 . Director of Research, Nigerian Institute of Advanced Legal Studies 2003 – 2006 and 2009 -2013. First Teslim Elias Distinguished Professor of Law, Nigerian Institute of Advanced Legal Studies 2013. United Nations Institute for Training and Research (UNITAR), UNICEF, DFiD, USAID, World Bank, World Bank Institute, International Labour Organisation, Ford Foundation, ECOWAS, African Union, West African Institute for Finance and Economic Management (WAIFEM); Federal and state Ministries, Departments and Agencies (MDAs) in Nigeria. Founder and Trustee, Human Development Initiatives (HDI) one of the leading social development NGOs in Nigeria. 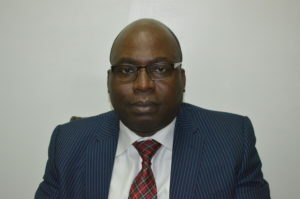 Until his appointment as Chairman of Independent Corrupt Practices and Other Related Offences Commission, ICPC, on 4th February 2019, he was the Executive Secretary and head of secretariat of the Presidential Advisory Committee Against Corruption (PACAC) Nigeria. In that capacity, he drove the advisory and strategic work of the think tank and led the key activities and preparation of key policy and anti-corruption strategy interventions of the government since 2015. He coordinated/conducted over 60 capacity building programs for anti-corruption agencies, prosecutors, investigators, judiciary, civil society, media and other stakeholders. Member of key anti-corruption and governance initiatives e.g. Justice or Impunity? High Profile Corruption Cases Crawling or Gone to Sleep. HDI, 2014. Asset Recovery for National Development PACAC July 2016. “Sub-Saharan Africa and Development Finance” UNITAR Research Document No.6, 1999. “The Problems of African Debt Negotiators” UNITAR Research Document No.7, 1999. “Corruption: The Enemy Within” in Political Reform and Economic Recovery in Nigeria, Ayua & Guobadia (ed.) NIALS 2001. Successful Anti-Corruption Campaigns: The Role of Government, Private Sector, Civil Society and Lawyers paper presented at Nigerian Bar Association Anti-Corruption Commission Conference on the Fight Against Corruption in Nigeria: The Way Forward, June 2015.